It is the go to choice of cleaning professionals for non-toxic odor control. From sewage treatment plants to the smallest household odor challenges, this natural product contains autotrophic, aerobic, and facultative enzymes, coenzymes and exoenzymes that safely and completely removes, not cover up, even the strongest odors. The Odor-Control Answer® is a natural biochemical product in a highly concentrated mass of autotrophic, aerobic, and facultative enzymes, coenzymes and exoenzymes. A complete system of microorganism stimulation. 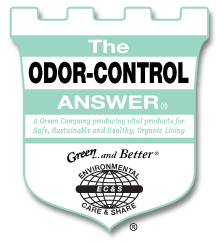 The Odor Control Answer® - is designed to neutralize odors. It reduces and eliminates odors associated with restrooms, stale smoke areas and greasy kitchens by breaking down the composition of odor-causing microorganisms that feed and breed on bacteria. It is also designed for grease traps, sewer lines, drains and septic tanks. Commercial Grease Traps Add 1 gal every 2 weeks or as needed.